IT.WAS.SO.HARD. Doesn't he look PISSED? This pic is after we removed a bunch of sod and started digging. Again, not a true 'before' picture. Sue me. Wouldn't it be delightful to step out of the sunporch onto a patio? With a margarita in hand and Jack Johnson playing in the background? Ah, yes my friends. We had a dream. One quote for $8200 (!!) later, our dreams were dashed and we were doing the work ourselves. Poo. So we went to the stone place and ordered our pavers, supplies and, just because we wanted things to be more difficult, huge blocks for a seat wall. Let's get a close up of our paver-laying skills, shall we? A 300 sq ft patio completed just before our summer party. And I mean, hours before. We still need to cut, reconfigure and use concrete adhesive on the seat wall. And we still need to figure out what to do with all the leftover pavers, but for now we are chillin out, maxin, relaxin all cool. Yeah....who am I kidding? There is no relaxing at this house. Nevah. 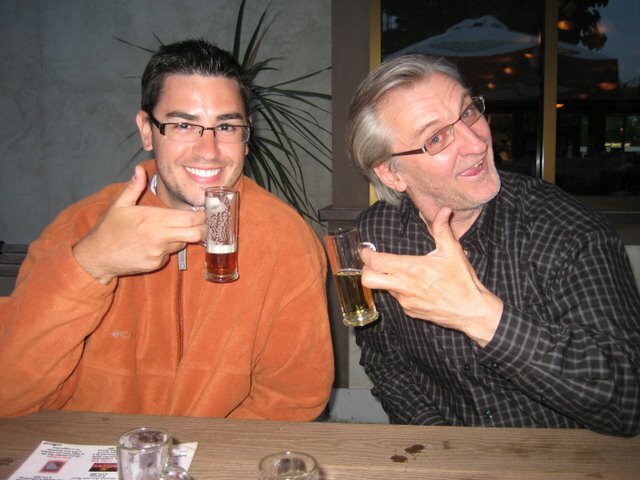 We can still have a celebratory brewskie, though. Me and my mom, the man and my dad. 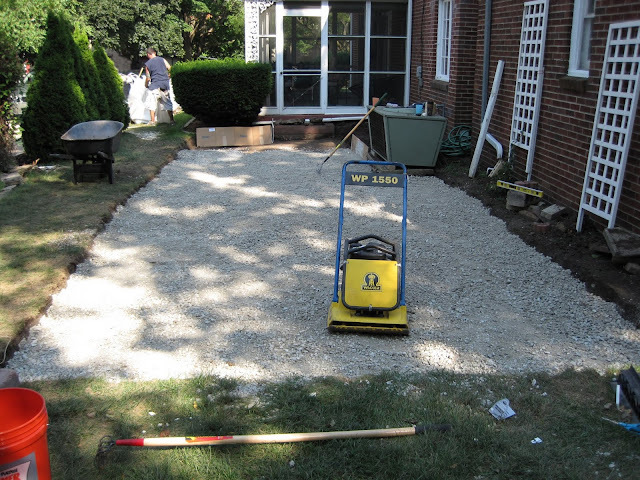 This is not our patio, and was taken way before we even thought of the project, but you get the idea. Thanks to mom, dad, brother, and everyone that helped us with this project. And thanks to everyone who came over to 'break in' the patio for hiding beer cans all over our landscaping! You jokesters, you. I think you're right. 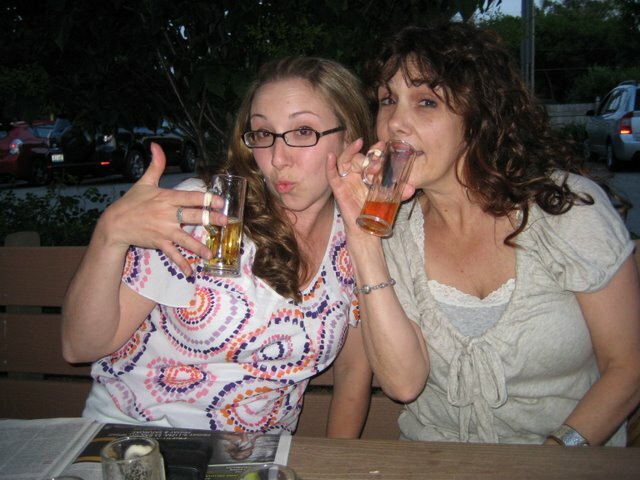 Maybe beer is good for plants? I was so excited to see that this was YOU on YHL! 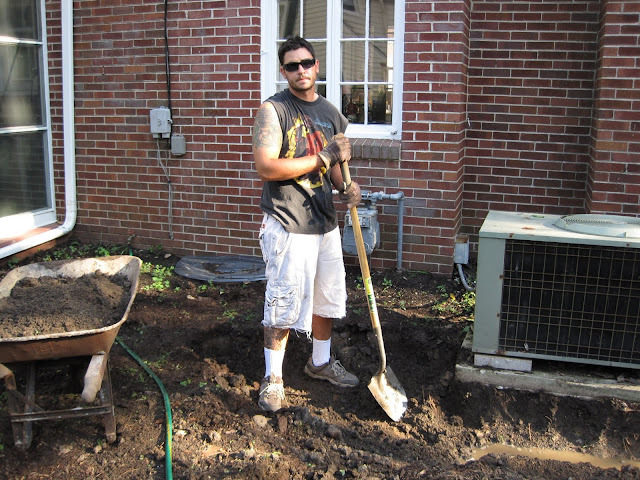 A reader of my blog was featured on the Godfather of home improvement blogs! Haha simple pleasures. 1. I love your patio. Truly spectacular. 2. I literally could not agree more with you about the misuse of the word "literally". Wooooow! What an awesome transformation! We're putting on a deck this Spring and I can.not.wait! to break it in!! Saw your makeover over on YHL and it's AMAZING! You did a much better job than the "professionals" the previous owners of our home hired. Our brick paver patio has weeds and is buckling in places, because they clearly didn't create the right foundation. Awesome job!! Love the furniture, too. You're on YHL! How cool is that?! That is amazing!! Where did you buy your chairs and table from? We got the chairs from Home Depot, and the matching table I found on HomeDepot.com because they didn't have any more in the store. I think they have this (Hampton Bay? )set every year, too! We didn't buy anything until late August, so we got the clearance pricing. Congratulations on a nice patio. Did it really take 11 tons of gravel? 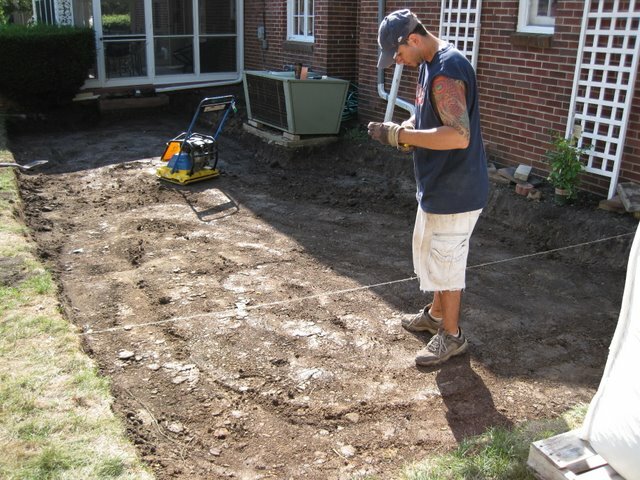 I was thinking about DIYing a patio at my house, but it looks like a lot of work! Great job! I am filing this away in my "honey do" folder for our house! Anon 2:12: Yep, we purchased 11 tons of crushed limestone, 2 tons of sand, and it seemed (in the beginning) like we could never use it all, but we did! We had 9 inches of ground to fill, over 300 sq feet. We had just enough materials to finish! btw - we hired someone (for a day) to help us wheel the gravel into the 'pit' and spread it around. A wise investment for $100! I'd love a tutorial. 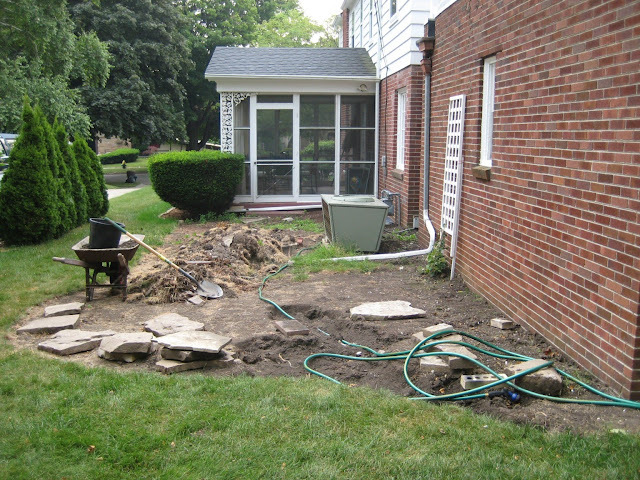 We plan to redo our patio and use pavers. One question though fellow Wisconsite... How do they last in the Wisconsin weather? I'm worried about freezing water shifting pavers or salt affecting the color (stained & stamped concrete is apparently ruined with salt). Threeacres - Concrete pavers are much stronger than concrete slab and stamped concrete. They resist cracking, as well as damage from freeze-thaw and salts. 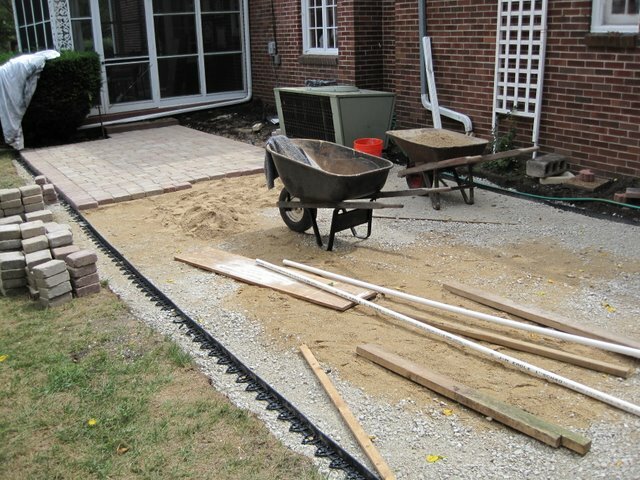 We got ours from Belgard, and they have a very high quality product. Plus, any cracked pavers can be replaced easily. The only thing we know we will have to do next year is replace some of the sand in the cracks in between the pavers! Great job! I have to agree with a comment you made in your letter to YHL: the HEAVY (sometimes very costly) umbrella stand is SO worth it. If anyone needs a stand,yYou will not be sorry, I guarantee it. Got mine on Overstock. Love your makeover. WOuld you mind if I showcased it on my blog with links back to yours ? I think my readers would love to see it..
Great job! So worth the hard work for all the money you saved. Karen - Yeah, I just wasn't going to take chances on a cheap stand. I got it half off at summer end. $170 was a little steep, but $85 I could handle! Mr. Williamsburg - I would be delighted to be featured on your blog! Please, link away! awesome! keep making great stuff! I've been reading your blog on and off all day (nevermind the half-peeled wall-paper eyeing me from my kitchen) and I am getting the biggest kick out of it! Great projects and great writing! Thanks for distracting me from the DIY doldrums! Love the patio. Where did you buy your edging? You mention that it's 'beast edging'. 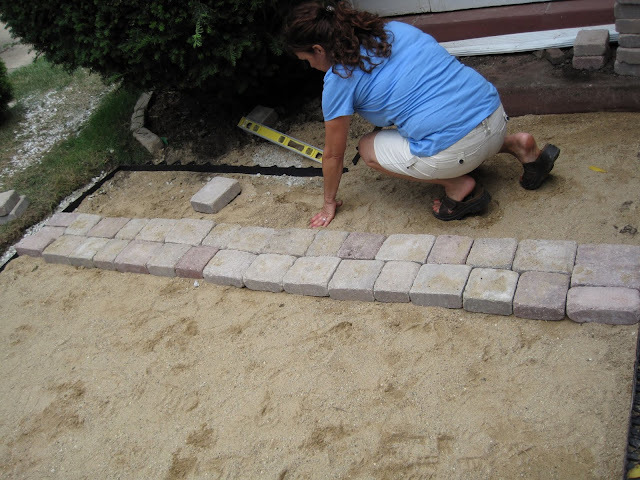 Anon - we got our edging from the stone yard along with our pavers. If you contact your local stone yard, they may have it there as well. It's actually B.E.A.S.T edging, and it was really easy to work with. I haven't been able to find a direct retailer online, only stone yard websites. Be-a-u-tiful! I'm impressed! My husband and I have been through similar transformations, but always get held up with the $ component and usually leave things 'unfinished.' You two do excellent work together. 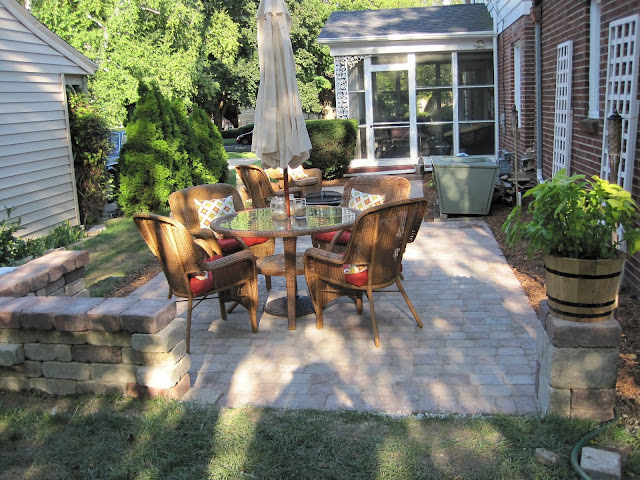 We're talking about creating a patio for entertaining in the back yard. 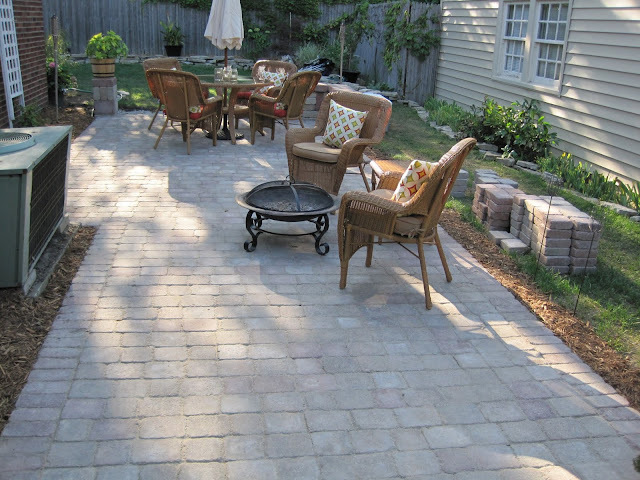 What made you decide to use pavers instead of flagstone/slate? I'm on the fence on which one to use? Was it the look of the pavers that appealed to you most, cost, etc? Just curious! Thanks! 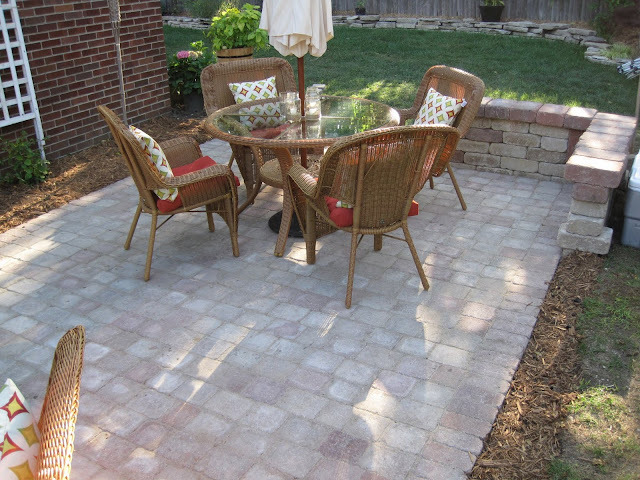 Anon, we went with pavers because we liked the look and they are pretty easy to install - they fit together like a puzzle. FLagstone and slate can be different heights, which makes the installation trickier. 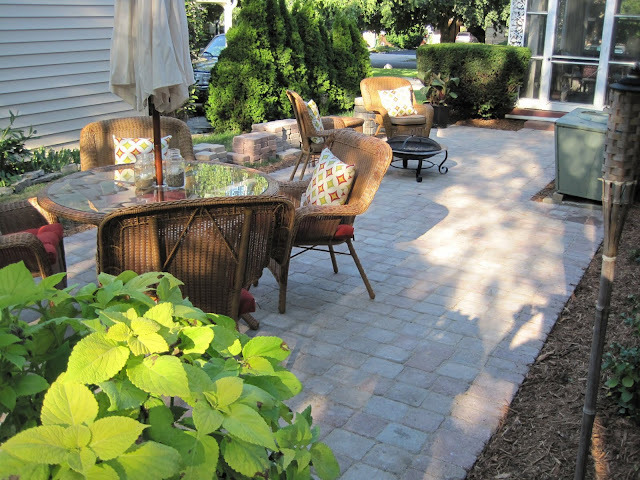 The pavers are concrete and are designed to withstand all the elements in WI. It also didn't hurt that all the pavers we bought were on clearance because they were discontinued!